Check our events calendar as times may vary! You don't need a special occasion to get your bounce on. 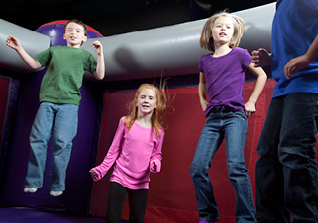 Give us a call and reserve your spot at our next All-Ages Open Bounce, then come on by and enjoy our awesome inflatables, fantastic games, and wall-to-wall fun. You bring the socks - we'll take care of music,and everything else! Check out our Events Calendar for exact dates and times of our Open Bounces.